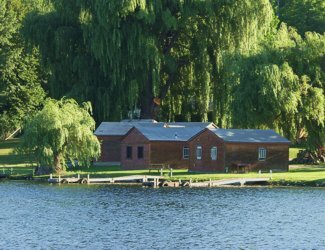 Fletcher Pond is well known for its monster pike, bass, and the great number of perch and pan fish. Six pound bass are caught every year, with pike in the 30 inch class a common site. Abundant waterfowl is another thing that makes Fletcher Pond so special. 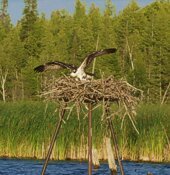 Duck and geese use the pond as a resting area on their migration route and it is the largest hatching ground for Osprey -creating a bird watching paradise. Meanwhile the Mackinac State Forest and other surrounding public lands hold many game birds for hunters. Whitetail rifle and bow hunters will find these same areas a great place to get that trophy buck. Our accommodations consist of 14 waterfront cabins and duplexes that sleep three to five persons. Each features its own kitchen and private bathroom. Also included with your rental is one dock space, a campfire pit and picnic table. We offer a boat launch for those of you bringing your own boat or you can chose to rent from our boats and motors. 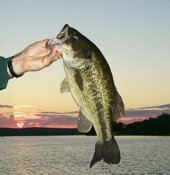 Meanwhile our tackle shop sells live bait and many of the lake's hottest lures as well as other amenities to make your stay enjoyable.